What a shock for those who wanted tickets for this. I hope you are all able to get tickets now. 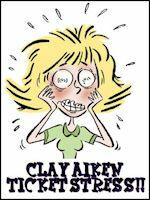 Oh the Clay Aiken ticket stress, but it is good to be going through it again. The tickets for the Clay Aiken Ruben Studdard concert are a hot item. Yikes………I hope the people who wanted tickets from this place were able to get tickets today!! Yikes, they caught us by surprise. I hope everyone who was trying for tickets was able to get them. I think I'll go watch some clack from the last time Clay appeared there. Good luck to all trying for tickets. I did get tickets for Asheville today. Hope the other venues aren’t going to pull a surprise also. I got my preferred ticket yesteraday! Hooray! Wow! I hope everyone that wanted Chautauqua tickets was able to get them. Clay and Ruben are going to be great in concert together! Not only do they both have talent, they are funny together too! Error: Error validating access token: Session has expired on Tuesday, 21-Aug-18 16:13:01 PDT. The current time is Tuesday, 23-Apr-19 17:37:33 PDT.